Although quality carpets make a wonderful centerpiece, you might not always want your rug to be the focal point of a room’s décor. Instead, carpets can also serve as wonderful complements to other pieces, laying the foundation for a room’s motif rather than immediately attracting the eye. When planning to use a rug in this manner, consider using subtle neutrals to complement rather than overpower the room’s other features. Beige, ivory, black, white, and grey all carry a room’s décor without detracting from it, and are a wonderful option when you are looking to make a subtle statement with a rug. 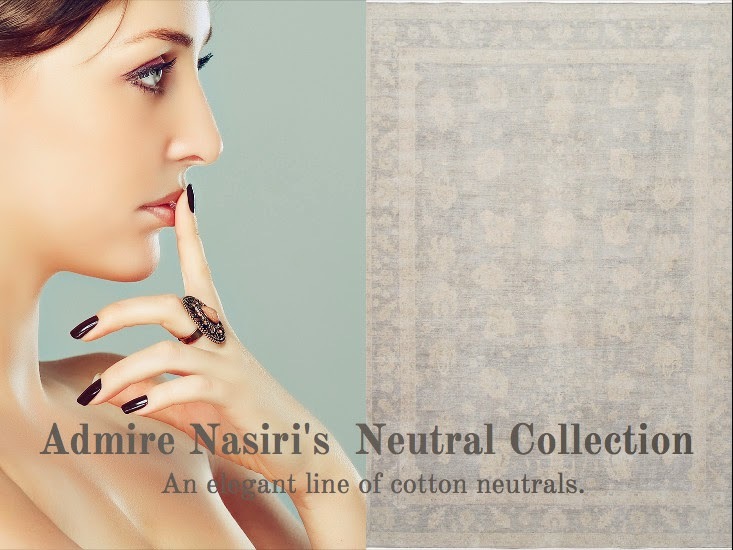 For summer, Nasiri is focusing on an elegant line of cotton neutrals. These artistic pieces are the perfect complement to virtually any room or design format, and have the special ability to add to a room without stealing its thunder. We often get stuck in the mindset that a rug has to be the most colorful, exciting piece in a room, but this is far from true. Dating back hundreds of years, rugs have always been a symbol of elegance—but this isn’t to say that they have to be the star of the show. Sometimes the greatest sign of strength is an ability to bring out the best in those around you—and this holds true with interior design as much as it does with interpersonal interactions. With the season of sunshine and warmth upon us, turn your eye toward the understated elegance of classy, neutral toned, comfy cotton rugs. Our handmade pieces are sure to take a favorite room and make it downright cozy.